Here are the two most recent Chaitén bulletins from SERNAGEOMIN to be made publicly available (at the OVDAS website and at the comprehensive Chaitén site run by Werner Luis): no. 119 covering 1-31 May 2010 (PDF) and no. 120 covering 1-15 June 2010 (PDF). The main news is that the alert level for the volcano has been reduced from the highest level of Red to Yellow, reflecting SERNAGEOMIN’s judgement that the eruption is in decline. Translations as follows. The alert level for the volcano is changed to LEVEL 4 – YELLOW: CHANGES IN THE BEHAVIOUR OF THE VOLCANIC ACTIVITY (eruption probable in days or weeks). A total of 140 seismic events were recorded, of which 77 were related to rock fracturing. These were principally located around and to the south of the volcanic caldera, at depths of less than 7 km. 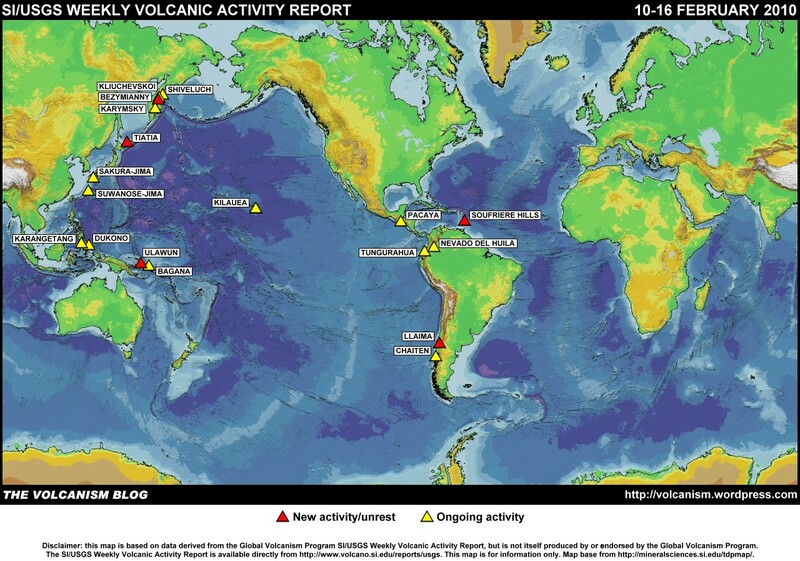 Regarding fluid dynamics, 63 earthquakes were identified, mostly of low energy, possibly related to hydrothermal processes and/or the release of magmatic gases at low pressure. The images received from the cameras installed around the volcano highlighted four fundamental aspects: (1) no occurrence of ash emissions; (2) days with minimal degasification at the surface of the dome; (3) days with degasification of the dome complex much enriched with water vapour and at low pressure, this last related to periods of rain and atmospheric humidity; (4) at least two small zones of nocturanal incandescence, located on the north-west flank and centre of the dome complex. 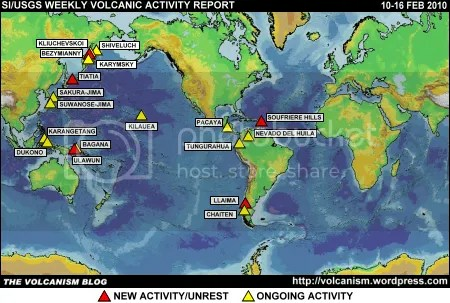 Seismic activity has been characterized by low energy, such as has been recorded since January 2010, which confirms that there have been no new eruptive processes of magma movement, and little release and movement of volcanic gases within the conduits has been detected, which may be related to the cooling process of the dome complex. From the foregoing, it is concluded that the current eruptive process is moving into a phase of decline, with few [eruptive] manifestations. Consequently, the volcanic alert level is changed to LEVEL 4 – YELLOW. It is stressed that it is possible for the system to move to new phases of disequilibrium and eruptive stages. 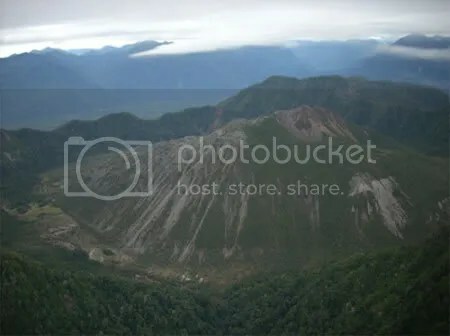 Given the large size of the dome there is a continuing danger of collapses, possible explosions and the generation of block and ash flows which may affect the valleys surrounding Chaitén volcano. Also, there is a continuing danger associated with the transport and sedimentation of volcanic materials, including fine ash, along adjacent river valleys and their mouths in coastal areas, particularly during heavy and prolonged rain. SERNAGEOMIN continues monitoring and will announce in a timely manner any changes in the volcano’s activity. Posted by admin in Chaitén, Chile, NASA Earth Observatory. 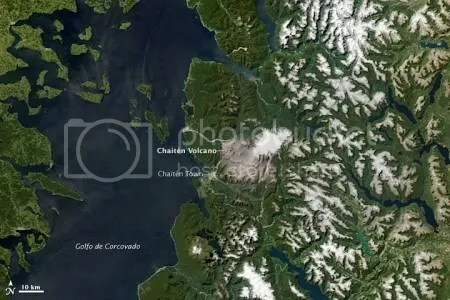 At the NASA Earth Observatory a new natural colour image of Chile’s Chaitén volcano and the surrounding area has been published in the Natural Hazards category. Captured on 25 February 2010 by the Moderate Resolution Imaging Spectroradiometer (MODIS) on NASA’s Aqua satellite, the image shows the large area of recent grey ash deposits around Chaitén volcano and the ash-choked rivers draining the area. The site of Chaitén town, dangerous and officially abandoned but still, apparently, a tourist magnet, can be seen at the mouth of the river to the south of the volcano. Posted by admin in activity reports, Chaitén, Chile, volcano monitoring, volcano tourism. The Chilean state emergencies office ONEMI has felt the need to remind everyone that Chaitén volcano in southern Chile is still dangerous and on red alert. Recently activity at Chaitén had appeared to be in decline, but in a bulletin issued on 15 February 2010 ONEMI notes that ‘although seismic activity has declined overall in recent months’ there was an increase in the number of events recorded during the period 21 January to 5 February (as reported in SERNAGEOMIN’s bulletin for that period) and warns that the continuing seismic activity around the volcano and constant gas emissions and incandescence at the dome suggest that ‘the volcanic system retains a high degree of instability’, and that the danger of collapses, explosions and debris flows remains, meaning that red alert still applies to Chaitén. This reminder that Chaitén remains dangerous may have been at least partly provoked by an influx of tourists, both Chilean and foreign, to the area. The officially abandoned town of Chaitén seems to have been playing host to large numbers of visitors. ‘All the [tourist] cabins are open, and other hotels as well. It’s surprising how many gringos are walking the streets’, says one local. Another dismisses the red alert warning as ‘a lie told by the Government … there has been no shaking, and there is nothing stopping people coming’. The pressure group ‘Hijos y Amigos de Chaitén’ (sons and friends of Chaitén) also attacked the Government for issuing the warnings: ‘The situation is completely normal today. There are no tremors, no fumaroles, ONEMI is lying’, says the group’s chairwoman, Rita Gutiérrez. 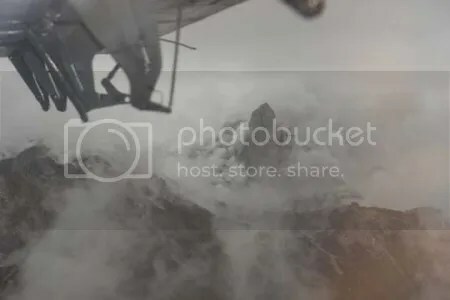 Local councillor Bernardo Riquelme claims that a group of tourists have recently climbed the volcano and encountered neither tremors nor emissions. La Tercera reports that visitors to Chaitén are up by 50% on this time last year: ‘There is no light and no drinking water, but this does not prevent the flow of visitors that has increased in the last few months’. In neighbouring Argentina there is anger at the ‘alarmist’ nature of some of the Argentinian press reporting of the Chaitén (and Llaima) warnings. The Patagonian paper Diario El Chubut reports the comments of one ‘visibly annoyed’ Environment Ministry official in Esquel who criticizes uncritical and sensationalist reporting by the press ‘who wanted to report something much more catastrophic than the reality’. The national press in Argentina, he complains, failed to communicate with either the Chilean or the Argentinian authorities, and put out distorted and alarmist reports based on their misunderstandings of the information released in Chile: ‘These are … technical reports intended for technicians, and it often happens that these reports come into the hands of untrained people who end up distorting the information’.